The 268 FlatSide Paddle XR17 holster from Aker fits a wide variety of popular semi-automatic weapons. 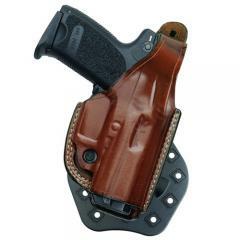 It is named for the feature that makes it comfortable for long-term concealed wear: the whole holster pocket is formed away from the body, leaving the contact side completely flat. Its AirFlo paddle design improves breathability as well, and features twin retention barbs that keep it from moving around as you walk. The holster pocket includes a full-length sight channel and a dual-plane muzzle for standard and short barrels, making it compatible with a wide range of firearms. Its built-in thumb break improves retention without slowing down your draw, and the holster also includes an adjustable tension screw for a secure custom fit that also acts as a trigger guard stop. Not impressed. The gun rides too high, and there is way too much gap between the paddle and the holster. It is not usable for concealed carry. Superb quality, great retention at a reasonable price. I'm very pleased with my new holster. Working as a UC I work 10 hour days or longer, it's very comfortable and I can take it off and put it back on with no problem. A handsome, high-quality, comfortable leather paddle holster at a reasonable price. I bought it for my 4" XDS 9mm even though its designed for the 3" model. Barrel length not a factor due to the open bottom edge of the holster except that the front sight on the 4" model can get caught when drawing. I got around it practicing a slightly modified draw but the binding could be a big negative for some folks.